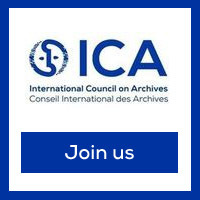 The International Council on Archives invites you to celebrate the International Archives Day on Saturday 9 June 2018! We invite you to celebrate the International Archives Day on the theme of the ICA Yaoundé Conference 2018 "Archives: Governance, Memory and Heritage" which will take place in Yaounde, Cameroon from 26 to 28 November 2018. 1. Starting from today, save the date: Saturday 9 June 2018... and, as it will be weekend, why not extend it for the whole week? 2. Get inspired by what your colleagues around the world have organized last year ! 3. Under the theme “Archives: Governance, Memory and Heritage”, choose right now your project to participate in the event: an exhibition, a slide-show, a film screening, and open your department to the public, explain your work, raise the profile of your colleagues and explain how they can help other departments in your institution or your company. 4. In order to facilitate your events, ICA makes available, cutomizable communication templates (posters, bookmarks, etc. ), to encourage everyone to share this day through social networks, business or family circles. 5. And because ICA wants to highlight your projects and the dynamism of archivists and records managers, please think of taking photos of your customized posters and documents, as well as your celebration on Saturday 9th June and send them to us ! 6. Starting on February, present us your event and send us your programme so that it can be displayed in the Interactive map (your poster and whatever document that you previously customized). Take advantage of this great exposure of your work to the general public! Saturday 9 June is your day ! Share this day with #IAD18.